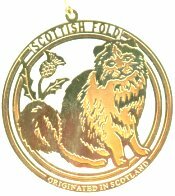 This brass ornament features a Scottish fold cat. 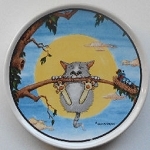 The brass ornament is three inches in diameter; the brass is etched then die cut. The different colors on the photo are the result of the camera flash and the back lighting. Comes in its own special folio. Ornament was purchased at a sample sale. Manufacturer has discontinued the item. New.